Looking at the things now decried by so many urbanists, ranging from urban renewal to freeways to restrictive zoning that makes building difficult, it’s notable how many of them are well-nigh ubiquitous. Surely some city, somewhere must have realized that these were mistakes, if mistakes they were. But very few did. Thinking about cities takes place in a world without any concept of strategy. Harvard business professor Michael Porter, the godfather of strategy, has said, “Competitive strategy is about being different. It means deliberately choosing a different set of activities to deliver a unique matrix of value.” This is exactly the opposite of thinking that goes into cities, in which no matter what the locale, urbanists or policy advocates of various stripes always seem to have the same solutions that they prescribe for every community, regardless of how different our places are. To see this in action, just look at how some urban advocates see the future in Chicago. Today’s urbanist orthodoxy says cars bad, transit good – basically always and everywhere. This logic has been internalized by them in Chicago. Consider a recent proposal by the city to reduce parking requirements an increase density near transit stops. This one is actually a laudable policy that makes a lot of sense. But it’s worth considering the broader strategic context in Chicago. What is it, fundamentally, that sets the city apart in the marketplace? Why live in Chicago instead of say New York, San Francisco, or Boston? 1. Price. A middle management couple with children can actually afford to buy a sizeable, 2-3 bedroom, modern condo, with a parking space, in the city. Even if taxes go up substantially to pay off its mountain of debt, Chicago will retain a big cost advantage over coastal metros. Many of the city’s neighborhoods remain very reasonably priced, even for working class households. Unlike the way a lot of other cities are trending, Chicago is much more than micro apartments for Millennials. It’s a place you can actually afford to stay and raise a family. 2. Car Friendliness. 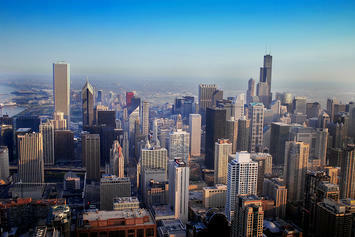 Chicago gives you the best of both worlds. You can ride the L, take a bus, walk, bike, or taxi when it suits your needs, but still own and park a car affordably and use that when it makes sense. The latter point is one urbanists are loath to acknowledge, but is huge, particularly for families. Parents can commute by transit to the Loop, cab to dinner, walk with the kids to the corner ice cream shop, etc. But when they want or need to, they can pile into the car and drive to a full sized supermarket, Target, Home Depot, Costco, etc. and stock up. (And their large apartments and condos mean they can actually store the stuff they buy). They can also strap the kids into car seats and drive to Wisconsin on the weekend, or to visit family. Or have a car for reverse commuting to the suburbs. To see the value of this, consider this interview with a resident of New York’s Upper West Side, who cites as the best thing about a local grocery store called Fairway that, “You could find everything at Fairway.” This might seem an odd compliment in most of America, where grocery stores that carry “everything” are ubiquitous. But not in some of these places like central New York, which are dominated by bodegas and small footprint stores, you can’t drive, and there’s nowhere to put a massive supply of food anyway. On Saturday, for example, I, also on the Upper West Side, needed a bottle of regular light (non-extra virgin) olive oil to make mayonnaise. By the time I needed it, I knew Trader Joes would have massive lines stretching around the entire store. So I walked to the nearest (small) grocery store, which only had extra virgin olive oils. Faced with either a long walk to another grocery, which also might not have it, or trying my luck with various nearby bodegas, I ordered it on Amazon Prime Now for two hour delivery. Luckily I didn’t need it immediately. Delivery is awesome, but it should be possible to find basic things without resorting it. I can assure you in my old place in Chicago, one quick trip to Jewel or any of the other plentiful supermarkets would have taken care of that. Stores like that, or like Sam’s Wine and Spirits and host of others, only exist because they are able to draw from a trade area served by the car, and because people can buy large quantities best transported by car. In short, the car is a bit part of what gives Chicago its livability advantage over coastal cities. So while accommodating those who don’t own a car is great, degrading the urban environment for those who do is not. Unfortunately, this is what many transport advocates want to do. For example, they are backing a proposed Bus Rapid Transit (BRT) line on Ashland Ave that would reduce the number of travel lanes from four to two, and ban most left turns, for 16 miles. Fortunately, this appears to be dying on the vine in the face of neighbor opposition, but it’s a valuable lens into urbanist thinking. Where Ashland Ave. BRT fails is not in its attempt to improve transit service or to accommodate those who choose not to have cars. Rather, the problem is that it is rooted in a vision, propounded mostly by coastal urbanites, that believes car use should be deliberately discouraged and minimized – ideally eliminated entirely – in the city. Thus the project is not just about making transit better, but also about actively making things worse for drivers. That might work in New York, San Francisco, or Boston, where the car is more dubious, but in Chicago this philosophy would erode one of the greatest competitive advantages the city enjoys. In Chicago, the car free strategy only works along the north lakefront and downtown, not the Ashland Ave corridor or most of the rest of the city. The no-car philosophy as the norm, not just an option, would undermine one of the greatest strategic advantages of Chicago. Why would you want to do that? Particularly when it would also make family life in the city more difficult for many. There is where urbanists need to start putting on their strategic thinking hat. Otherwise they may end up undermining the very places they seek to improve. There is certainly plenty of room to make investments in non-car travel modes in Chicago. The North Main L clearly needs renovation, and it’s ridiculous that the CTA spent so much money on much more lightly traveled lines while ignoring its crown jewel. But where Chicago has the chance to really shine is in urban cycling. The city is nearly ideally suited for bicycling. It’s flat. Its citizens are hardy types who aren’t afraid of a little cold or bad weather. A grid street system combined with diagonal routes provides fast anywhere to anywhere biking in ways often even faster than transit, which often requires transfers for destinations other than the Loop. Buffered or fully protected bike lanes are feasible in many places without major degradation of the driving experience. Plus, with the city’s financial problems, bicycle infrastructure is very attractive on a price/performance basis. Chicago has already done a lot for biking under Emanuel, and it can easily continue to do more. But actively degrading the ability of residents to use a car in the city is not a good idea for Chicago. Advocates for urban areas have a lot of good ideas that can make our cities better, but they need to think about how those ideas apply in the context of specific city or neighborhood in question. One size fits all thinking didn’t work in the past, and it’s still a bad idea today. Aaron M. Renn is a senior fellow at the Manhattan Institute and a Contributing Editor at City Journal. He writes at The Urbanophile.